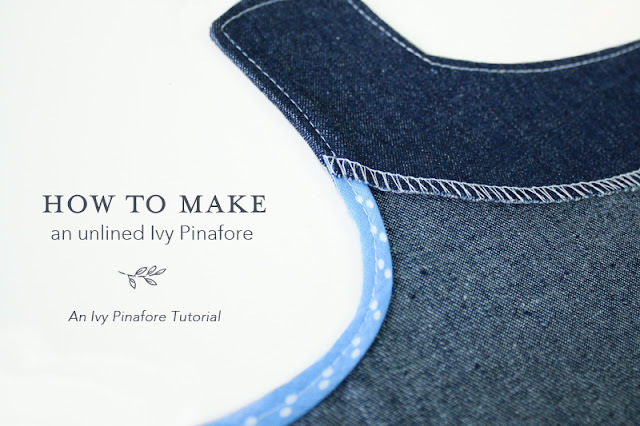 I was planning this post for the second or third of the Ivy Pinafore Tutorial Series, but I've had so many people ask me how to do it since Ivy was released, that I thought I'd better just jump in and share how to do it sooner rather than later. The technique I'm showing you below requires no flat pattern adjustments (yay!! ), but there are lots of different ways to achieve the lining-less look. 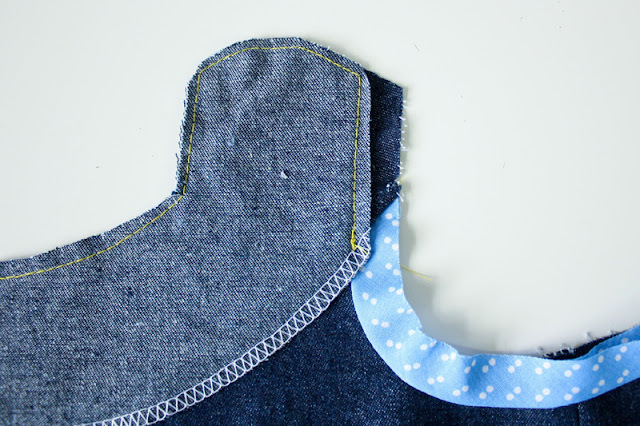 I like this one because it's relatively easy and it allows you to keep the pattern intact throughout the whole process, making it much easier to line up pattern pieces and match notches and curves as per the instructions included with Ivy. You'll end up with a flawless Ivy, that is unlined, yet still clean inside and out, without having to make any guesses, or 'wing' any part of the construction. Note - I'm only using half pattern pieces in the tutorial below (un-interfaced) and only showing the front of the dress most of the time since the technique is exactly the same for the back. The technique is the same for both views. 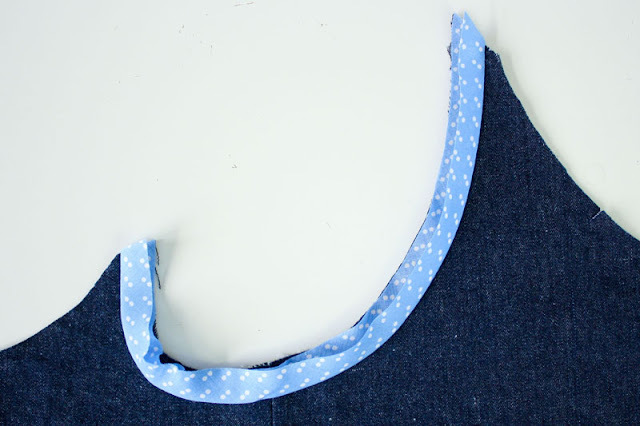 Note - making your own bias binding is super easy, in fact, here's a tutorial I prepared earlier. 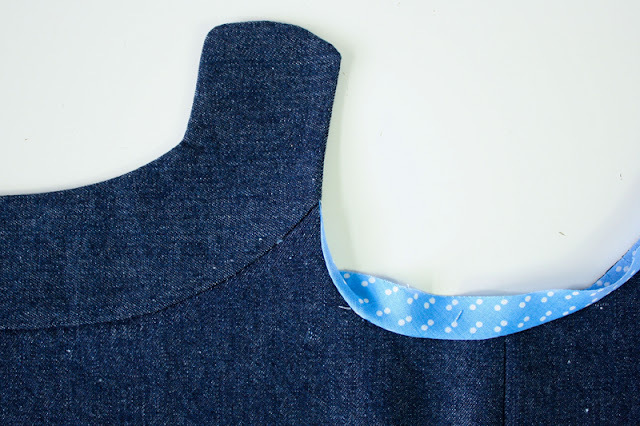 Even if you hate making bias binding, you don't need much for this unlined Ivy Pinafore variation. 1. Cut out all required Ivy pieces except for the lining. Assemble front and back dress pieces as per the instructions. 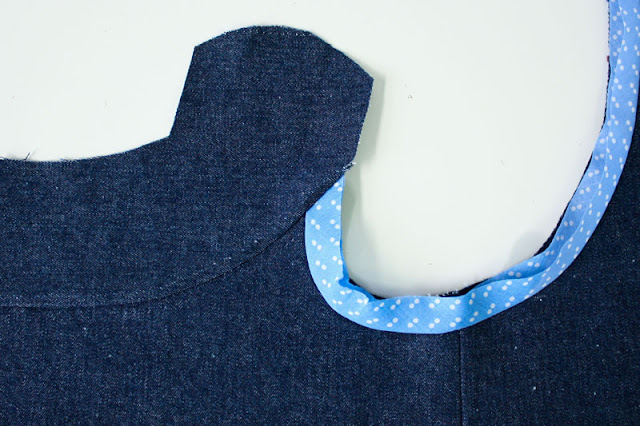 Attach pockets (if using them) and sew together dress side seams as per the instructions (don't attach the yokes yet!!). 2. 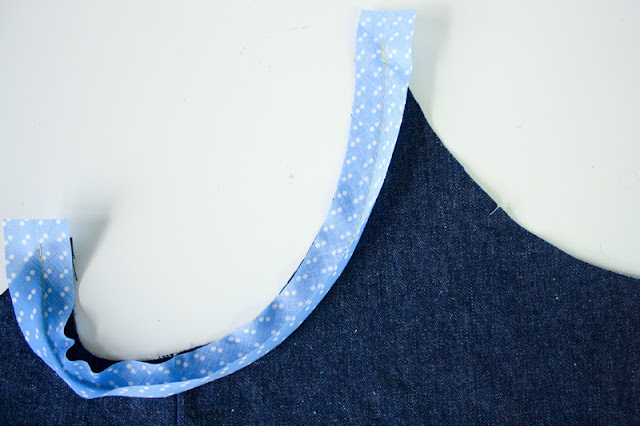 Measure the length of both armscyes and add an extra 5-10cm (2-4") to this total length. 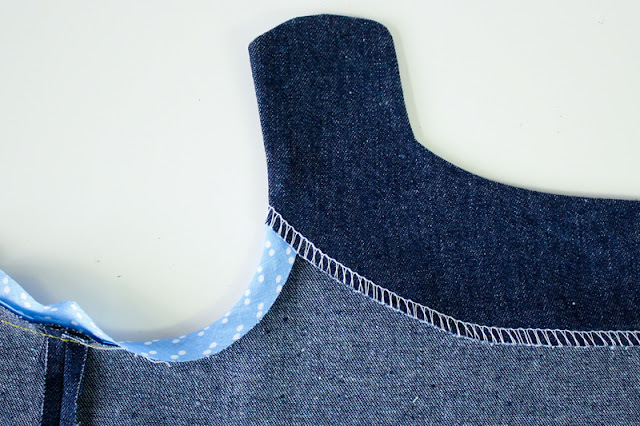 Make that length of bias binding using this tutorial. Cut length in half (one for each armscye). 3. Take your bias binding and right sides together, pin down along the armscye, matching raw edges. 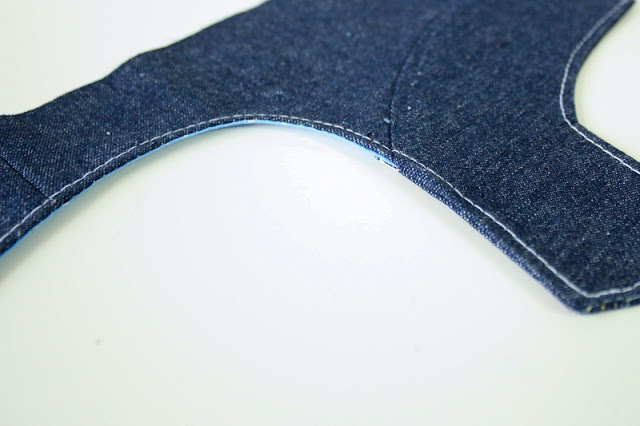 Stitch down using the 1.5cm (5/8") seam allowance included, from one side of the armscye to the other. Repeat for other armscye. 4. Press binding up on both armscyes, so that both raw edges match with the raw edge of the dress armscye. Attach both front and back yokes as per the instructions included with Ivy. Top stitch as per instructed if you want too as well (I haven't for this tutorial). 5. Finish the bottom raw edge of both your front and back facing yokes. 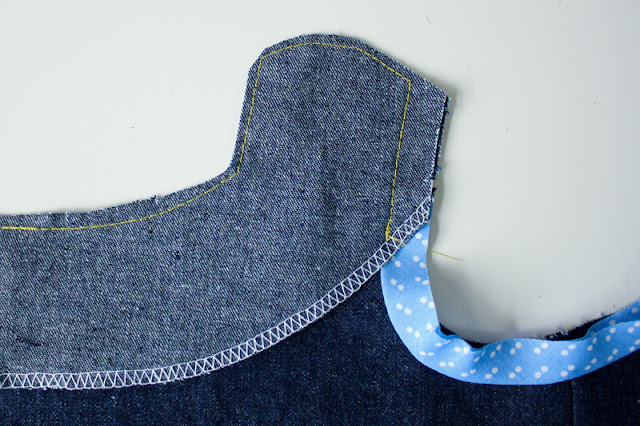 I have overlocked mine, but you could finish with a zigzag stitch, bias binding or using pinking shears. 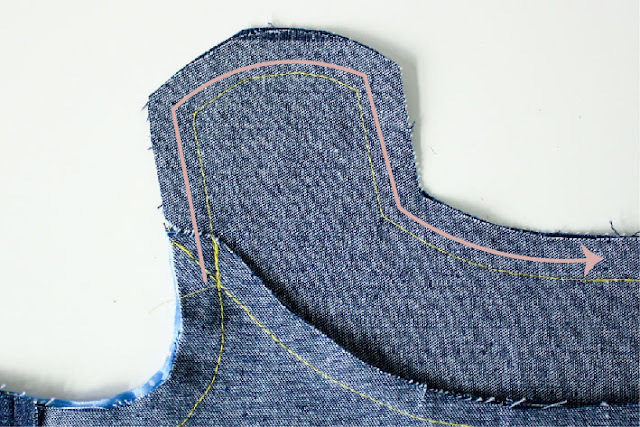 I would avoid turning and stitching the raw edge under as this could result in a bulky facing. 6. Right sides together, pin your facing to your dress. Repeat for back yoke. 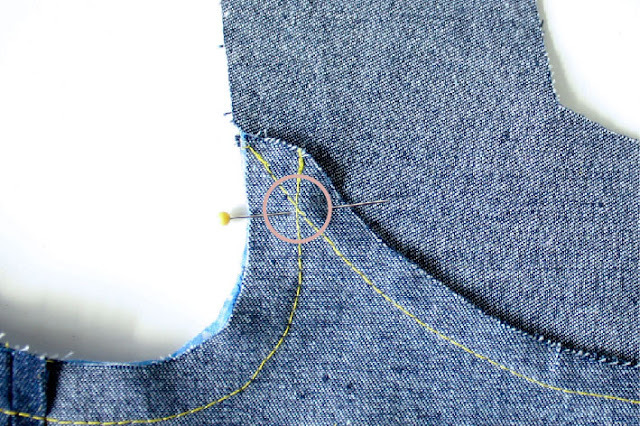 Make a note of where your bias binding stitching intersects with your yoke stitching on the front of your dress (circled below!) 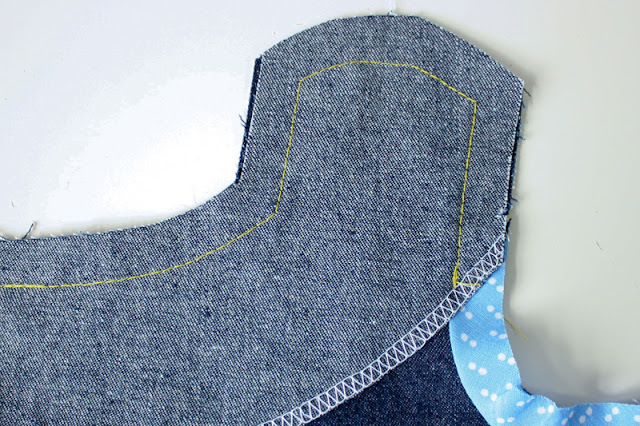 - this is where you'll start your stitching to attach your facing yoke. 7. 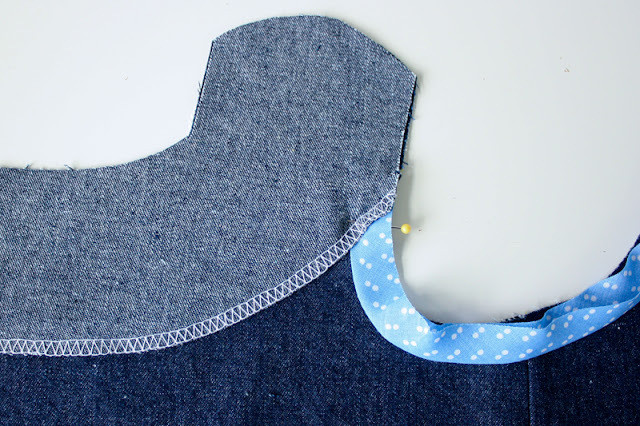 Stitch your yoke down as per the instructions included with your pinafore, starting at the intersection you marked above. Back tack at each end. Repeat for back yoke. Note - I turned my sewing around and stitched my yoke down with the underside of the dress facing me, this made it easier to make sure I placed my needle directly into that intersection for a precision start. This is what it'll look like from the 'right side'. 8. 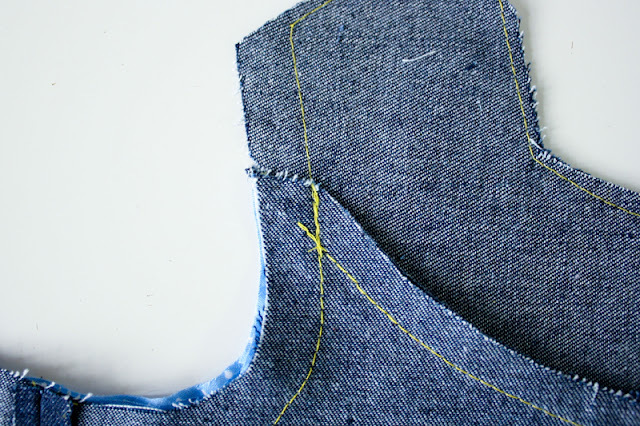 Trim down seam allowance and notch corners/curves along the top of the yoke only. Leave the armscye section. 9. 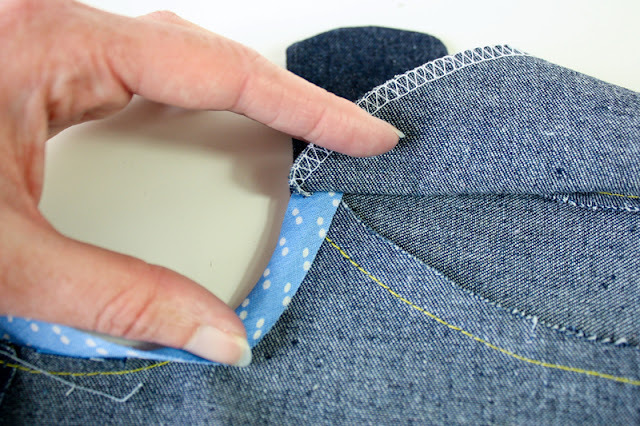 Trim down the facing seam allowance only. 10. 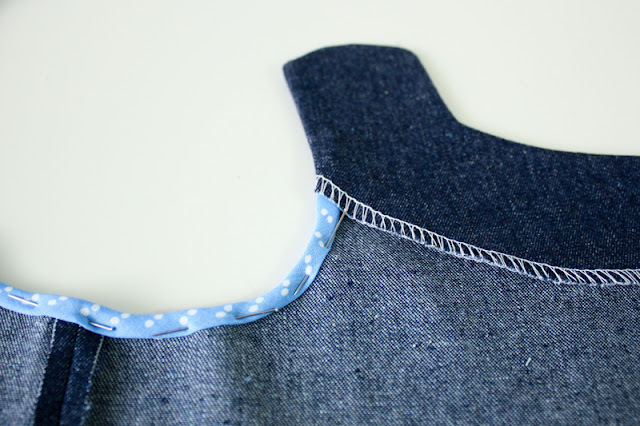 Unpick the first few stitches of the stitching attaching your bias binding to your yoke within the seam allowance. 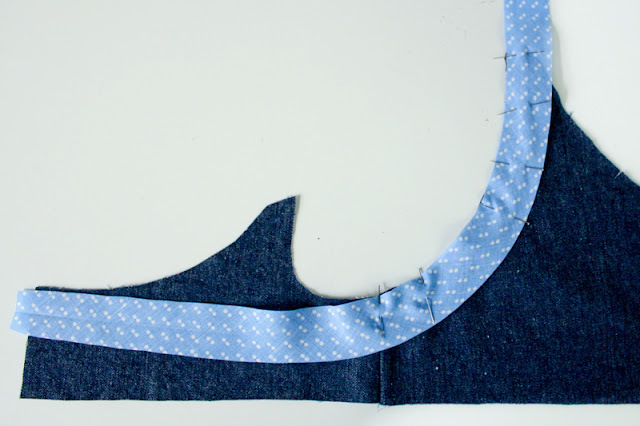 If you've top stitched, you'll need to unpick the same amount of that as well. 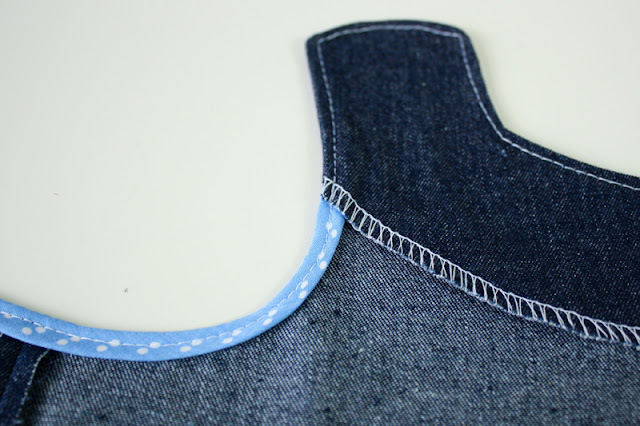 Leave enough stitching to match the remaining seam allowance you've left around your yoke from step 8. Repeat steps 8-10 for back yoke. 11. 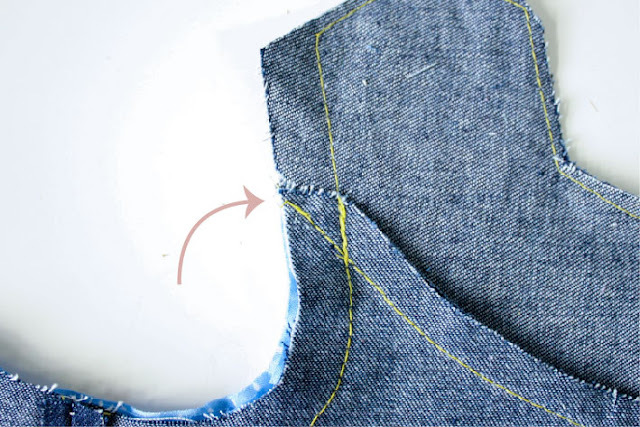 Trim down and notch the remaining seam allowance around your arm scye, removing the 'bottom' of the bias binding at the same time (aka the side of the bias that is right against the dress seam allowance). Make sure to keep the 'top' of the bias binding!! 12. Turn your front and back yokes right-sides out. This will naturally bring your bias binding around to the underside at the same time. Press. 13. 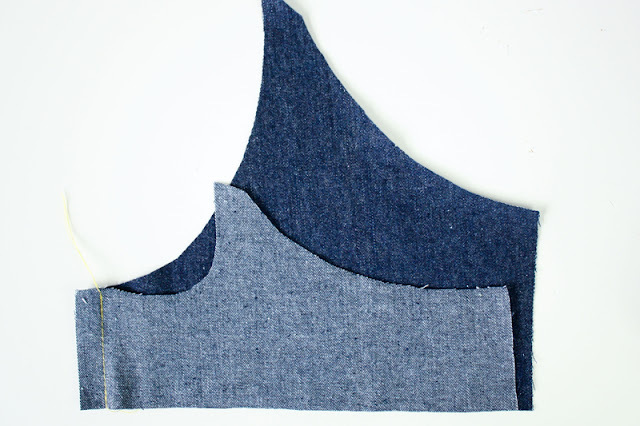 Gently lift your facing yoke piece and tuck the raw edge of your binding under (essentially folding the remaining bias binding edge in half). Do this along the entire armscye. Pin in place. Repeat steps 9-13 for the other armscye. 14. Top-stitch binding down at the same time as top stitching your entire yoke down (as per the instructions included with Ivy). 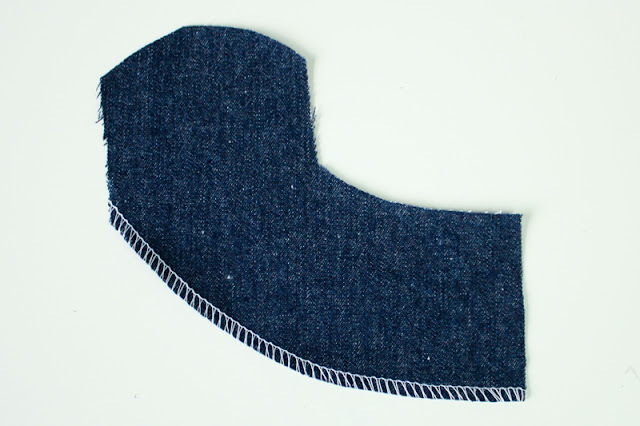 Because you've folded your remaining bias in half, the raw edge will catch nicely. Gosh, that was a long post huh? I just wanted to make sure I captured every step of the process with as much detail as possible, so, er, hopefully this helps if an unlined Ivy was on your list of 'Things to Make'. Let me know in the comments if you have any questions, or if anything is confusing. 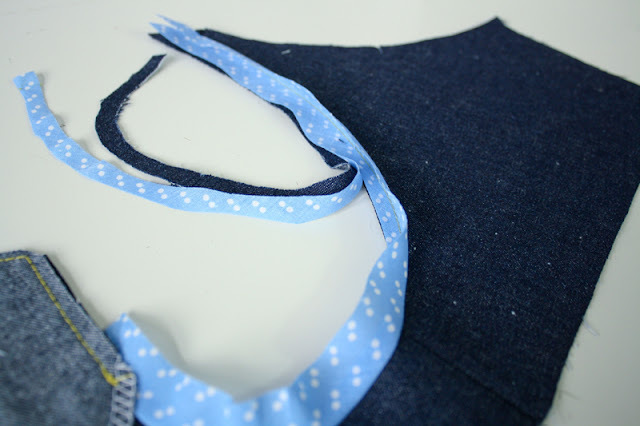 Will you be making an unlined Ivy Pinafore?